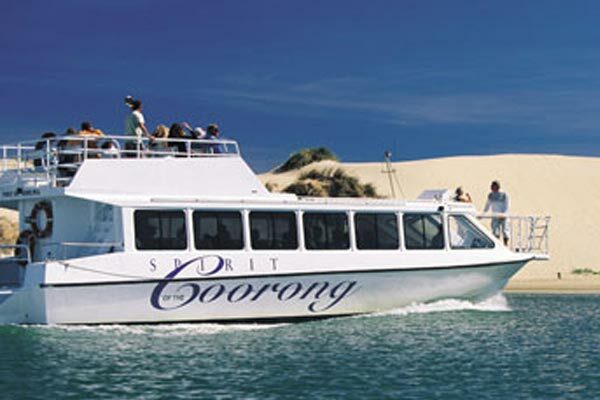 Spirit of the Coorong Adventure Cruise departs from the main wharf in the old river port town of Goolwa. Cruise to the Goolwa Barrage, through the lock and into the Coorong National Park to view the mouth of the River Murray. From the mouth the cruise heads into the pristine waters of the Coorong, past the spectacular white sand dunes and birdlife, as your captain provides an informative and entertaining commentary on the passing scenes, birdlife and history of the area. Disembark for a guided walk through the sand dunes of the Younghusband Peninsula to the undisturbed white sandy beaches of the Great Southern Ocean. Along the walk your guide will talk about the cockling industry here, the sand dune flora and fauna and how the Aboriginal people lived in the area. A delicious lunch of cold meats and salads is served with tea or coffee (special meals are available by prior request – vegetarian, gluten free etc) as the cruise continues deeper into the Coorong waterway. Passing the Ewe Island and Tauwitchere Barrages that separate the estuarine Coorong from fresh water Lake Alexandrina your captain will explain the man-made barrage and lock system that extends along the River Murray and tell you of the associated benefits and environmental impacts. Deep into the Coorong, at Cattle Point, walk with your guide into the sand dunes again to learn more about the aboriginal occupation of the area, see the middens left around their old campsites and discover fresh water as the aboriginals did. Afternoon tea is served as the cruise returns past the imposing sand dunes and back through the lock to the Goolwa Wharf where the cruise ends.